Can You Leave A Cat Alone In A Hotel Room? The answer is, “It depends.” Not all pet-friendly hotels are created equal. According to Lindsay Richards, a writer for GoPetFriendly blog, different hotels have different policies. For example, some hotels that bill themselves as “pet-friendly” accept only dogs. Others charge extra for bringing a pet, and still, others forbid guests from leaving the animal alone in the hotel room. 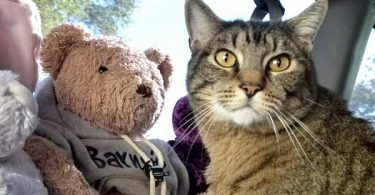 The last requirement may be tolerable if all the attractions and activities you have planned are also cat-friendly, but it’s more than a nuisance if you planned to go somewhere that won’t welcome Fluffy. How should you choose a hotel? Given that, your first step will have to be researching the hotels you’re considering. After finding the information on the hotel’s website or a website like GoPetFriendly, you should call the hotel to make certain that you have the most up-to-date information. Richards recommends choosing motor inns or motels because you can generally park right outside the room. That makes it a lot easier to carry your luggage, cat(s), and cat-related gear to and from your room. Lawrence Marcus, a writer for “Food & Wine’s” travel section, suggests renting a suite. He points out that most housekeeping staff won’t clean a room with a loose pet in it. Getting a suite enables you to lock Fluffy and her gear in the bedroom, while the staff clean the other rooms. Marcus noted that his cat seemed to enjoy the hotel room, for it came with a windowsill wide enough to sit on, so she could enjoy the view. Heidi the cat also found a number of hiding places under the furniture, in the cabinet under the bathroom sink, and in the closets. Richards also recommends checking the hotel website for pictures of a typical room to check for things a cat might destroy. For example, Richards herself avoids picking rooms with carpets or leather furniture because she knows her cats can’t be trusted with either of those. How can you find a hotel that accepts cats? Some travel sites list hotels or hotel chains that accept cats. According to GoPetFriendly, for example, lists nine hotel chains that allow cats. The PetsWelcome website has a search engine that helps you look for cat-friendly hotels. Choose the state and city nearest your destination and see what comes up. The results will list hotels and include brief descriptions of their pet policies that cover such matters as additional fees and limits on the number and/or size of the pets. They also include the date when the pet policy was last updated. The TripsWithPets website has a page that provides a long list of hotel chains that accept pets. Clicking on a name will provide you with an overall description of the chain’s pet policy. In some cases, the policy can vary depending on the location of the hotel. Thus, you should call the hotel about their pet policy before booking a room. The Kimpton chain may be the most pet-friendly hotel chain of all. The founder, Bill Kimpton, had a dog when he established the first hotel in 1981. As he liked taking his dog with him when he traveled, he made sure his guests could do the same with their pets. There are thus no restrictions regarding the breed, number, or size of the pets, and Kimpton does not charge extra or require a deposit for bringing an animal. What questions should I ask the hotel? Karyn Wofford, a guest blogger for the Figo Pet Insurance website, suggests asking a hotel several questions about their pet policy. Some of these, like questions about pet fees, will often simply confirm the information on the hotel’s website. You should also ask about what happens if your cat damages something. Would you have to pay towards repairing or replacing the item? If so, how much? Does the hotel require any paperwork like vaccination records? Does the hotel provide litterboxes or other supplies? If they do, that’s something you won’t have to pack. What precautions, if any, does housekeeping usually take to prevent a pet from escaping? That is yet another matter to discuss with the hotel before booking with them. While a few hotels, like the Kimpton hotels, loan or rent pet supplies, most do not. Make sure some of these items are old favorites from home. Most cats find travel stressful, and the familiar smell and feel of items from home can help them calm down. You should also bring pet wipes to clean up small messes and to wipe Fluffy’s paws after she’s been exploring outside. Similarly, you should bring a stain and odor remover in case of accidents. No hotel will allow a cat to wander freely, so you will need a carrier and/or a leash. There are some carriers that resemble backpacks so you can have your hands free while toting Fluffy. If you plan on leaving your cat in the carrier for several hours, make sure it’s big enough to let them move around comfortably. Cat carriers that have built-in litterboxes. Many of these are designed for taking cats on road trips and provide the cat with a home away from home. The cat can sleep and even play with a toy in the carrier. What is a disposable litter box? As the name suggests, a disposable litter box is one that is made of a recyclable material like cardboard. Depending on the make, you can use it for one to four weeks and then throw it away. There is a disposable litter box for just about every cat. Some come with hoods, and others do not. There is one brand specifically designed for big cats, while a couple of others have low sides to accommodate kittens or older and arthritic cats. Some even come with their own litter. Many of the disposable litter boxes can be used as liners for standard litter boxes. One disposable litter box, the Kitty Kan Enclosed Travel Disposable Litter Box, is explicitly described as being designed for road trips. Is there a specific etiquette to follow? Yes. Pet-friendly hotels do expect cats and their owners to follow certain rules. 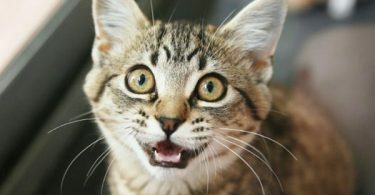 A staff writer for the “PetPlace” website describes the etiquette for keeping a cat at a hotel. For example, you need to let the hotel know ahead of time that you are bringing a cat or cats. You don’t want to find out when you get there that the hotel has changed the rules and no longer accepts cats. Make sure your cat is well-behaved and quiet. If Zuko the Siamese meows and yowls all the time, he will quickly wear out his welcome. Similarly, the hotel won’t appreciate a cat that claws furniture or bites people. Have your cat tattooed or microchipped in case they escape. These are more reliable forms of identification that tags, which can fall off the collar. Also, bring a recent color picture of your cat and vet records. Bring grooming tools and a lint remover to reduce the amount of fur Fluffy will leave on the furniture. Arden Moore, a writer Petcha, suggests putting a blanket or large towel on the bed, so Fluffy won’t shed on the bedspread. She also recommends putting the litter box and food dish in opposite ends of the bathroom to make cleaning up easier. On the other hand, if your guest room has a kitchenette, you can put the food and water dishes there. Use a leash or carrier when bringing Fluffy out of your room. Even a placid cat might bolt at exactly the wrong time if something spooks them. 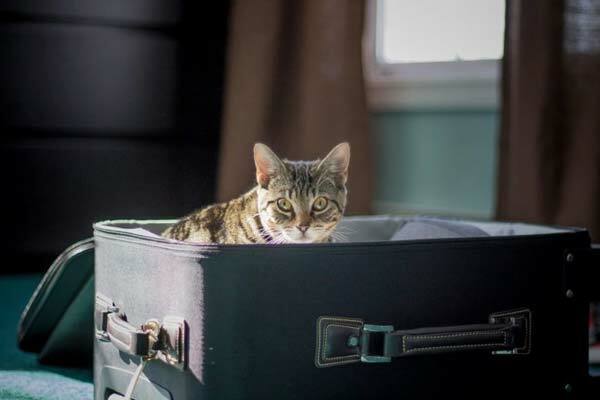 Keep your cat in the carrier in the hotel room when you aren’t there. Only let her out when you plan on staying. Remember, the maid may clean the room while you’re at the beach or exploring the town – and it isn’t her job to chase down a runaway cat. Clean the litter box regularly. Also, don’t let uneaten food sit, for it will attract bugs. How long can you leave a cat alone in your hotel room? The answer depends on such factors as the cat’s age, health, and breed. According to Shannon Cutts, a writer for TheHappyCatSite, the average healthy adult cat can be left alone for up to half a day. The longer the cat is alone, though, the greater the chances of something going wrong. For example, the cat could knock over its water dish and end up going thirsty. Some cats, like dogs, become anxious if left alone too long. Cutts notes that certain breeds are particularly dependent on humans. 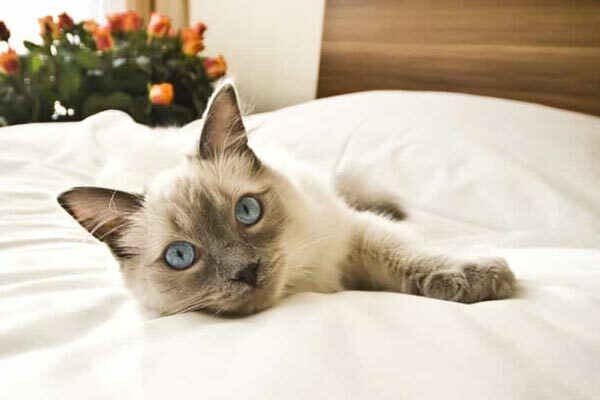 Such breeds include Sphynx, Scottish Folds, Ragdolls, and Birmans. These cats generally don’t like being left alone for even a few hours. According to the “All About Cats” website, claw caps, also known as claw covers or nail caps, are rubber caps that go over a cat’s claws and thus blunt them. The cat can still scratch, but she won’t be able to damage any furniture or people. Some cat owners consider claw caps a humane alternative to declawing. Claw caps come in a variety of colors, shapes, and sizes, so there is bound to be a set that will fit your cat. You can have your vet put the claw caps on Fluffy, or you can do it yourself. Unless your cat is extremely docile, however, it usually takes two people to do the job. Melissa Nelson, a writer for WikiHow, describes the steps in putting claw caps on your cat. She recommends trimming the cat’s claws beforehand with a nail clipper designed for cats. Claw caps come with an adhesive that will glue them to the cat’s claws. You put some adhesive in the claw cap and then slide it up your cat’s claw. As cats do most of their scratching with their forelimbs, you will only need to put claw caps on the front paws to protect the hotel furniture. A cat’s claws will continue to grow, and they will eventually shed the outermost sheath. Consequently, claw caps last about four to six weeks before falling off. According to The Spruce Pets website, Feliway is a synthetic pheromone used to reduce stress in cats and thus lessen or eliminate bad behaviors like scratching furniture or peeing outside the litter box. Feliway comes in two forms, a spray, and a diffuser. The latter is plugged into a wall outlet, and it will gradually emit enough pheromone to cover a room up to 500 by 650 square feet. The Feliway diffuser works only on one room, and its effects last for about thirty days. The makers of Feliway have also produced FeliScratch, which is designed specifically to stop cats from clawing furniture. It works by making scratching posts smell more attractive to cats and thus drawing them away from furniture and other items Fluffy should not be scratching. Why Does Your Cat Meow in the Hotel?